← Dudley and Frank: Bathroom Inspectors. OK, let’s address the big problem right up front: my titles are becoming more and more absurd. The Jack Pepper Variety Hour (6/4/64) is downright Film School George Lucas-y, what with its incomprehensible, artsy-fartsy numeric subtitle and all. But screw it, I like the incomprehension. The sketch itself started far from where it ended. I was thinking of those hipster bands with thirty members all wearing brown and shouting “hey!” in the chorus, and wouldn’t it be funny if one of the hipsters in brown – I dunno, maybe the second chair banjo, or the guy playing the washtub – was just a little off from the rest? You know, a little quiet guy in the back who just can’t quite nail the timing? The idea of assembling a thirty-part hipster band, though, proved too daunting. I just don’t have the money for that much beige corduroy. Who else sings in unison like that? 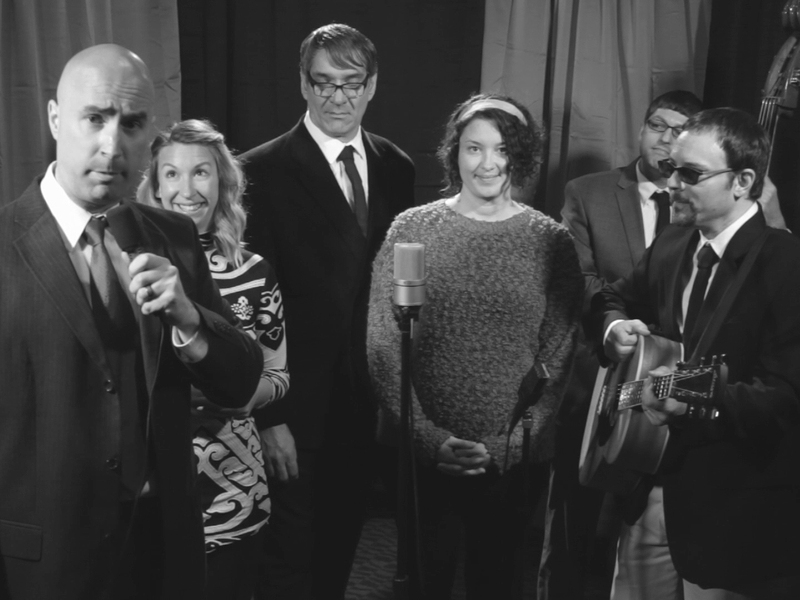 I eventually settled on a 1960s folk act (an all-white group called the Minstrels, for subtly is not my strong suit), and figured a pastiche of an Ed Sullivan-esque TV show (a format in which I’ve long wanted to tinker) would be the best outlet. Side note: I brainstormed a dozen or so character names for the host, trying to find that perfect square, show biz tone. It wasn’t until after the short was complete that I discovered Jack Pepper was indeed a real show biz type. Whoops. Writing the script was a breeze, since I knew all the heavy lifting would be done in the songwriting and filming. A few awful jokes for Mike Peake (as Jack Pepper) to barrel through, plus an awkward interview consisting almost entirely of joke exposition. (The set-up as written is embarrassingly clumsy; it only works on film because Mike and Lisa DeRoberts, as the bewildered Karen, play it so well.) It’s all too easy to write a screenplay that consists almost entirely of “and then they ad-lib a bunch of goofy whatever.” I see why Apatow and Feig do it so often. Another side note: the script was originally written for four musicians and the host. When Shane mentioned our bassist pal James Burns might be available to play bass, I added a few lines for him, but opted not to rewrite any of the dialogue describing them as a quartet. John has a whole spiel about how he’s the only one who plays an instrument, and he says it right in front of the bassist. These are the things that make me laugh, people. For songwriting, I reeled in John and Shane, still exhausted from Story Songs, to turn some very rough ideas into a complete tune. The trick was in writing a song that sounded good until you realized the words were amateurish, teenage poetry junk – but without getting intentionally silly. You know, a song that is dumb, but not stupid. It’s harder than it sounds. John recorded a demo and whipped up some sheet music (seeing a fake song I co-wrote as a joke turned into actual published sheet music is one of the more surreal experiences I will ever have), and here’s where my plan got cutesy. I wanted to shoot the thing as close to “live” as possible, to best recreate the style we were imitating. This meant three cameras running simultaneously – and it meant Lisa not hearing the song until that first take. To achieve this, we spent a Saturday with the cast (Amber Neff and Matt Hudson joined John and James; the script was written specifically with these people in mind, and it’s always a relief when everyone says yes) rehearsing the song, under John’s musical direction. Lisa was banned from attending. The following Saturday, we shot, sending Lisa into the hallway while the cast rehearsed some more. And then we rolled, all three cameras. Here’s where good casting and knowing your actors really takes off. Everything that happens once the song starts – including everything Lisa does – was completely improvised. All I had to do as director is tell them to do whatever they wanted, as long as a) the rest of the band ignored Karen’s dilemma, and b) nobody stop the song. All of Mike’s weird physicality, all of the band’s goofy posturing, all of Lisa’s sheer panic… all of it was made up by the cast, on the fly, with minimal interference from me. This is why you hire good people. We wound up shooting three takes of the full interview and song, with only minor adjustments in between. The third take is what you see in the finished product, with two exceptions – I pulled in audio from the second take in two small spots to correct some (very) slight errors. But other than that? What you’re seeing is 98% all one take, just different camera angles. Everything we shot for safety went unused. Editors know: this is a very good, very rare thing. With respect to my previous casts, I can’t remember laughing as hard as I did while filming Jack Pepper. At one point, I feared I had ruined a take, as I was shaking so much trying to stifle my laughs, I thought I bumped a camera. And it’s all because of the talented cast, who nailed everything I wanted from this: exaggerated panic laid atop sincere weirdness. Even the bits that don’t seem like jokes are jokes to me, just because they’re said with an offbeat tone or an unusual glance.